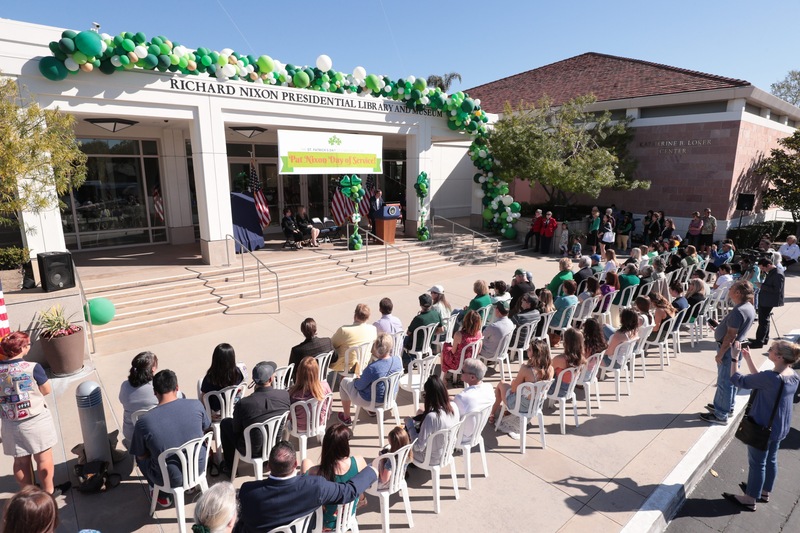 Over 2,000 people visited the Nixon Library on St. Patrick’s day to celebrate the first annual Pat Nixon Day of Service! The crowd was welcomed by Yorba Linda Mayor Tara Campbell, who declared March 17th Pat Nixon Day in the City of Yorba Linda. Cheryl Bartetzko of the American Cancer Society spoke of Pat Nixon’s earliest brush with cancer when she lost her mother at age 12, and how that loss became a driving force in her life. As First Lady, she supported the fight against cancer in an important way, championing President Nixon’s National Cancer Act which injected nearly $1.6 billion in federal funding to cancer research and additional funding to establish 15 new cancer research centers. Following the ceremony was an eventful day of family fun including a petting zoo, scavenger hunt, expert impersonation of Pat Nixon, and even leprechaun sightings! More than 15 charitable organizations partnered with the Nixon Foundation to create a fun filled atmosphere of community and service.